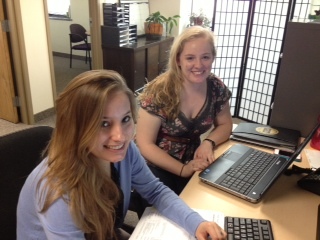 Smart Giving Matters: Get to Know our Summer Interns! Kalle Byers is the new Fund Development Intern at the Charities Review Council. She is looking forward to graduating in December of 2013 from the College of St. Benedict and St. John’s University. Kalle is majoring in Accounting with a Finance concentration and has a double minor in Psychology and Management. Kalle is very interested in the nonprofit sector’s impact on the community. 1. What is the most important thing you have learned since starting at the Charities Review Council? I have found networking and collaboration to be key tools for a successful nonprofit. The nonprofit sector is filled with many challenges, but with the insight and support of others, those challenges can become exciting opportunities. 2. What is your favorite nonprofit organization? There are many good nonprofits, but my personal favorite is World Vision, a Christian humanitarian organization. They are “dedicated to working with children, families, and their communities worldwide to reach their full potential by tackling the causes of poverty and injustice”. I have also learned about many great local nonprofits on the Charities Review Council list of organizations Meeting Standards as well. 3. Have you seen nonprofits have an effect in your community? Yes, I have worked closely with many nonprofits that have helped in a variety of areas. I have helped file tax returns for low-income families, participated in a mission trip to Ecuador, worked with Feed My Starving Children in collaboration with many organizations, and, most recently, enjoyed volunteering with World Vision for their poverty simulation. 4. Tell us about one of your hobbies. I got my PADI License when I was thirteen and have enjoyed scuba diving in Minnesota, Hawaii and Florida. I really love the quiet peacefulness of being underwater and just casually swimming by hundreds of years of history and tiny ecosystems that grow in the ocean. I am currently investigating my authentic leadership skills with the help of Bill George’s, True North. I also am strengthening my long-term planning skills by getting insights through Meg Jay’s book, The Defining Decade: Why Your Twenties Matter--And How to Make the Most of Them Now. 6. What cartoon character would you be? I would be Perry the Platypus on Phineas and Ferb because he solves crimes and is always there when he is needed. Brita Midness is the new Engagement and Marketing Intern at the Charities Review Council. Brita is a recent graduate of Colby College in Maine where she double majored in Global Studies and French Studies. In the fall of 2013, she will begin a Masters in Peace and Conflict Studies at the University of St Andrews in Scotland. 1. What attracted you to the Charities Review Council? The collaborative approach to strengthening communities initially drew me to the Council. The opportunity to learn about how to help charities increase their effectiveness within communities and how to help donors make informed giving decisions is something that I have very much enjoyed being a part of thus far. I believe that community engagement is an integral component in fostering respect and positive change within our community. 2. What is your favorite Accountability Standard? One of my favorites is the Impact on the Community Standard. This standard encourages organizations to not lose sight of the importance of having a positive impact in the community. Furthermore, it provides a means of measuring that impact and thus a platform that can be built on for years to come. As a native of Minnesota, I have seen how our vibrant nonprofit community takes a lead role in encouraging positive change in a variety of areas. Minnesota provides an arena for the effective use of cross sector partnerships that facilitate sustained community engagement. After living and studying in the USA, Switzerland, and the UK, the prevalence of nonprofits in each of the communities that I have lived was very encouraging. Despite the different issues present in each community, the role of nonprofits is important no matter where you are in the world. I am an avid reader and enjoy reading both fiction and nonfiction. After living in the US and Switzerland, I have developed a passion for languages and consequently, particularly enjoy reading literature in both French and English. Sitting down with a good book is one of my favorite ways to spend a rainy afternoon. 5. Do you have a favorite dessert? I am a fan of all desserts, but above all I love mint chocolate chip ice cream. My favorite sport is basketball and, being from Minnesota, I am a fan of both the Timberwolves and the Lynx.